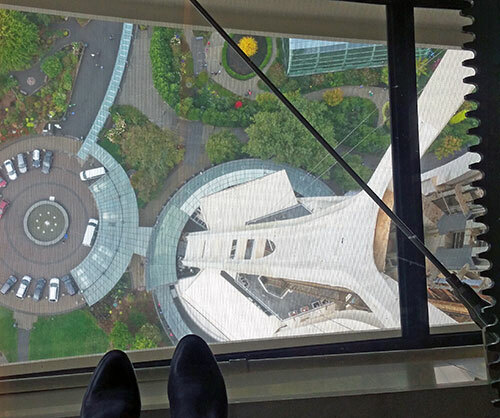 "SEATTLE'S SPACE NEEDLE GETS A GLASS FLOOR - 500 FEET UP!" 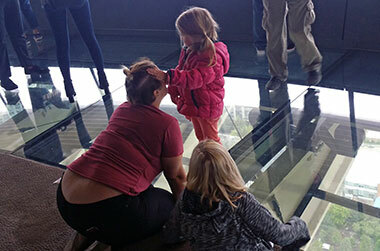 SEATTLE'S SPACE NEEDLE GETS A GLASS FLOOR - 500 FEET UP! safe experience you can have 500 feet up. Seattle’s Space Needle just got a great big jaw-dropping facelift and visitors are zooming by the thousands up the 605-foot-tall icon to experience some thrills, chills, wows, broad grins and spectacular views. 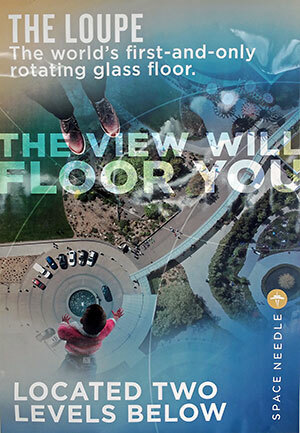 The Loupe, the world’s first-and-only rotating glass floor at 500 feet off the ground, is the main attraction. And, as the poster says, the view will floor you. You can see the Needle from a perspective that, until now, only the iron workers who originally built the Needle ever saw. 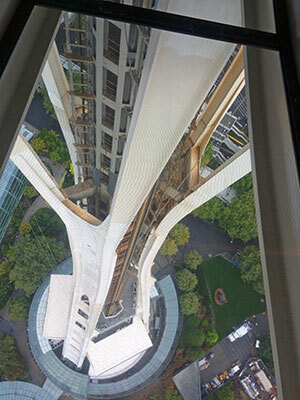 Promotion for the new Space Needle renovation features a dizzying view from 500 feet up. The promotional materials are truly surpassed by the real thing. This view looks directly down the Needle to the ground 500 feet below. This $100 million renovation is a logical result of a recent tourism boom in Seattle where the Space Needle is a must on every visitor’s to-do list. It was time for an upgrade of this iconic symbol of the spirit of Seattle. 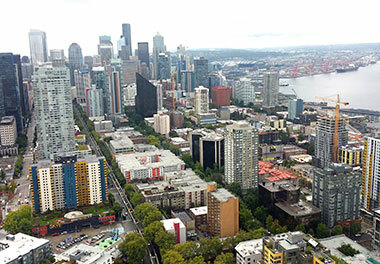 Views of Seattle from the observation deck and the Loupe are a spectacular 360 degrees. This view looks south towards downtown. Experience actually moving on the Loupe. The speed is slow but the experience is a bit disorienting. 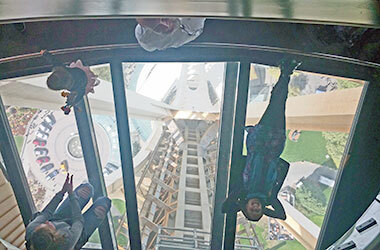 The thousands of visitors who get off the elevator at 500 feet above the city experience jaw-dropping views and, once they step onto the Loupe - the rotating floor. There is also an unsettling sense of being a bit knocked off balance. The only souls who are seemingly oblivious to any “danger” or sense of trepidation are the kids. 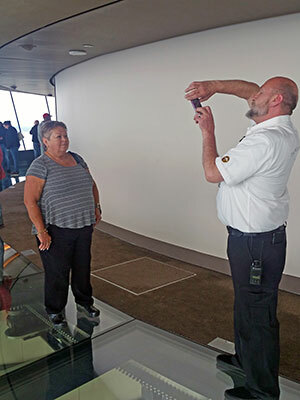 They can’t wait to charge out onto the revolving floor or lie on the Oculus floor to have their pictures taken from the Oculus Staircase above. One of these kids couldn’t wait to get out onto the glass rotating floor. Mom and sister sat on terra firma while they considered stepping onto and moving with the floor. One of the most popular places to take selfies or have someone climb the Oculus Staircase for the shot is the Oculus Platform. 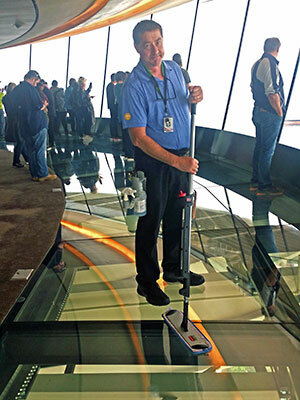 One of the unsung but critical functions of the Needle staff is - of course - cleaning the glass. This is not a once-a-day duty. People are continuously touching, walking, spilling, scuffing, leaning on this enormous surface - more than 20,000 square feet of glass. Unlike solid, opaque walls, benches and floors, these surfaces need to always be clear, clan and spotless - not only so visitors can see through them, but so they can take clear picture after picture after picture. The Chief Guru in charge of this gargantuan task Is Paul Best, Head Glass Keeper. He has a team of six cleaners who are here every day making sure the smudges and smears and scuffs are wiped clean. These guys seem to be the most popular people on the Loupe since visitors are always following close behind them, then quickly lying down on the cleaned floor or standing with their backs to the city for selfies through the freshly wiped skin of glass. 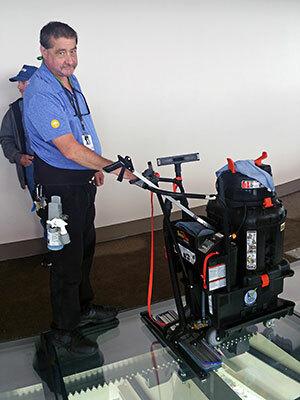 Glass cleaner par excellence, David Belogna, is one of the most popular guys on the Loupe. People follow close behind him to get super clear glass for photo ops. Mr. Bologna also drives the glass Zamboni. His job is never done! The busiest times for tourists taking pictures are sunrise and sunset. Paul also serves as an informal ambassador of the Loupe. This friendly, comforting gentleman talks with everyone, makes them feel at ease and often is able to coax a trepidatious visitor onto the rotating floor. His staff runs a constant Zamboni that continuously cleans the floor. When queried about what is used as a cleaning solution, he would only divulge that it is a secret liquid called “Halo.” And please know that ONLY old-fashioned diapers are allowed to touch any glass surface. 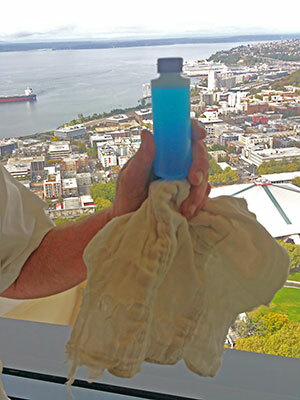 Mr. Best holds his secret tools for the cleanest, unscratched glass on the planet - “Halo” and an old-fashioned diaper. *It was built the same year as the Berlin Wall. *$3.92 was the hourly wage the ironworkers who built the Needle were paid. *The 120 x 120 foot lot the Needle was built on was the site of an old fire station and was bought in 1961 for $75,000 by investors including Bagley Wright. *There are 848 stairs from the Needle’s basement to the Observation Deck. 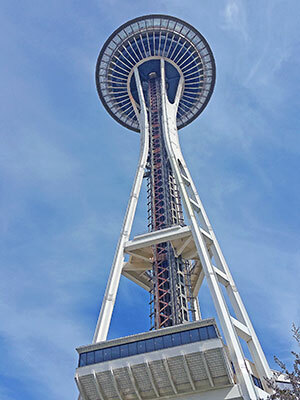 *It is 605 feet from the ground to the top of the Needle’s red aircraft warning beacon. *It takes 45 minutes to make one revolution of the glass floor which can go in both directions. *To turn the original turntable, it took one one horsepower motor. It takes 12 motors to turn the Needle’s new glass turntable which weighs 37 tons. *Ten layers of glass form this 37-ton rotating floor, and, including the new observation deck with glass walls and benches, the Needle now has 176 tons of glass overall. *1,300,000 people visit the Space Needle each year and 60,000,000 have visited since it first opened in 1962. 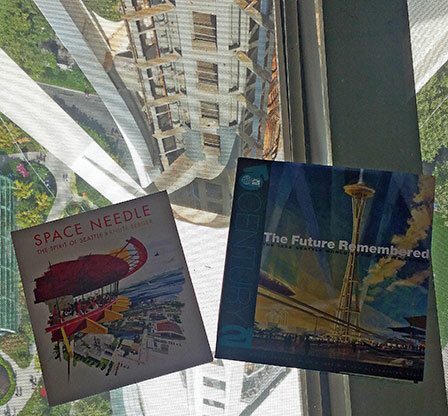 The Space Needle’s history is well documented in two books, treasures of lore and information about this iconic Seattle symbol. 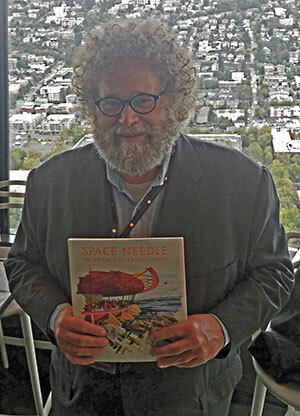 Knute Berger, author of Space Needle: The Spirit of Seattle, calls it “The Tower of Power.” It has also been called “A Flying Saucer on a Stick.” In 2011, Berger, who attended the official opening in September, was named Writer-in-Residence at the Needle while he worked on this book. A Seattle native, writer, columnist for Seattle Magazine, editor and author, Berger had the privilege of his own office at the Needle and access to staff and archives to research and write this history. The Future Remembered: The 1962 Seattle World’s Fair and its Legacy by Paula Becker, Alan J. Stein and the Historylink Staff tells the inside tale of how this whole iconic symbol began. Both books are rich with archival photos and fascinating facts. Knute “Skip” Berger, writer and historian of Space Needle: The Spirit of Seattle, joined in for the official opening of the Needle in September. The two best books on the history of Seattle’s iconic Flying Saucer on a Stick. After you’ve been to the observation deck and the Loupe, climbed the Oculus Staircase, seen the sights, gone through the jitters, and circled the city, you can zoom down the elevator in 43 seconds at 800 feet per minute, step out into the gift shop, swing by the virtual bungee jump capsule and top off your day with a jump off the roof of the Needle. Wowsah! Just buckle up, put on your goggles and hold on tight. It’s a hoot, but an entirely safe one since you never leave your seat. What a memorable finish to a Space Needle experience like never before. 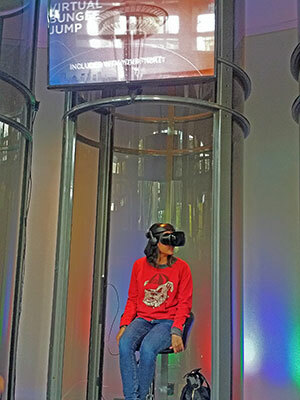 One of three virtual reality bungee jump capsules where visitors have the opportunity to launch off the top of the Needle. This experience is included in the price of admission. Absolute best tip for your visit - get a Seattle CityPASS and save 42% or more here and at other top attractions in the city including right next door at Seattle Center’s Museum of Pop Culture, Chihuly Garden and Glass and/or Pacific Science Center. Lynn Rosen, co-author of “Camping Washington,” Falcon Press, Emmy award-winner, ski guidebook editor and writer, and theater critic, has a long history of both broadcast and print journalism.